Report by Debadatta Panda , Kalahandi: Farmers suicide case occurring in western Odisha like Bargarh,Sambalpur,Nuapada districts due to heavy loan and loss of crops.Like that in Kalahandi a farmers suicided by hanging in his cropland in the Koksara Block of Kalahandi.Though Kalahandi is irrigated by Upper Indravati Irrigation Project but the Up Land area known as Dandpat area is not irrigated by UIIP. Secondly serial draught situation attract the local people for the migrant labour work. Bira Majhi aged about 55 years of Dhanpur village in Koksara Block of Kalahandi has suicided b y hanging himself.It is known that BIra was a small farmer having two acres of land as his paternal property and by cultivating that he was managing his family.He has given marriage to his two daughters and sent his two sons as migrant labourer for income and he was planning to repay his all of the loan made for the marriage and cultivation from the crop income . But on the draught situation the crop is going to be damaged the crop is to be damaged and his dream is to be smashes and Bira became mentally pressurised as told by the family mambers. As told by the wife of the deceased Bira,on the day of occurance Bira went to his crop land after his morning day to day work in a normal mind and at ten o clock they informed that Bira suicided on a Nimb tree at his cropland. Koksara police came to the spot and inquest the dead body and hand over to the family. But the family members as well as the villagers came to the NH26 at Koksara and demonstrated a Dharana demanding more help to the Bira”s family. Koksara Tahasildar and ABDO came to the demonstrators and assured them to provide all govt assistances to the deceased then the demonstration was called up. 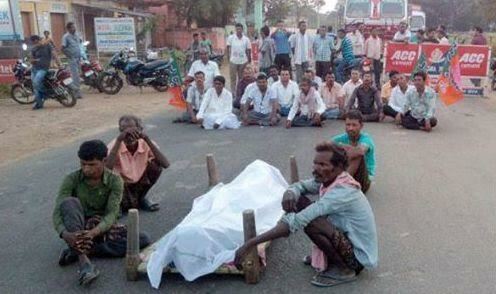 The farmers suicide cases spread throughout the western Odisha and now occurred in Kalahandi.It is anot a good symbol for the farmers said the intellectuals.Govt should take remarkable steps for the welfare of the farmers, demanded by the farmers organisations. Entry filed under: Agriculture, Agriculture and Irrigation, Athmallik, Balangir, Bargarh, Boudh, Deogarh, Farmer Suicide, Jharsuguda, Kalahandi, Nuapada, Region watch, Sambalpur, Subarnapur, Sundergarh.